Aligarh: A score of departments of studies and institutions at the Aligarh Muslim University organized programmes observing the International Mother Tongue Day (IMLD). The UGC Human Resource Development Centre organized a programme to mark the IMLD with more than 150 participants, including those of the orientation programme hailing from various higher educational institutions from Assam, Bihar, Jammu and Kashmir, Maharashtra and UP. Addressing on this occasion, Dr Taher M Pathan, Department of Modern Indian Languages, AMU highlighted the importance of regional languages and delved into their origin. Professor Abdur Raheem Kidwai, Director, UGC HRDC, emphasized the relevance of linguistic diversity and said it was a worthy initiative of the United Nations to celebrate the linguistic diversity in various soieties. He said that the day is a reminder of every citizen?s right to use his or her mother language. Dr Faiza Abbasi conducted a slogan writing competition on the occasion. At the Department of Urdu, while highlighting the importance of the day, noted Urdu scholar and critic, Prof Ateequllah said that people should make efforts on their own to safeguard and promote their mother tongue. He urged the Urdu people to make arrangement for the elementary education of their children in Urdu language as it was the best way to preserve the mother tongue. On this occasion, Prof Zafar Ahmad Siddiqui, Prof Syed Mohammad Hashim, Dr Khalid Saifullah, Prof Aqeel Ahmad Siddiqui and Prof Tariq Chhatari, Chairperson of the Department, also expressed their views. Naushad Ahmad and Abdul Hafeez Khan, presented poems on the importance of mother tongue. Two minute silence was also observed to mourn the sad demise of noted Hindi scholar and critic Prof Namwar Singh. Prof Mohd Ali Jauhar proposed a vote of thanks. 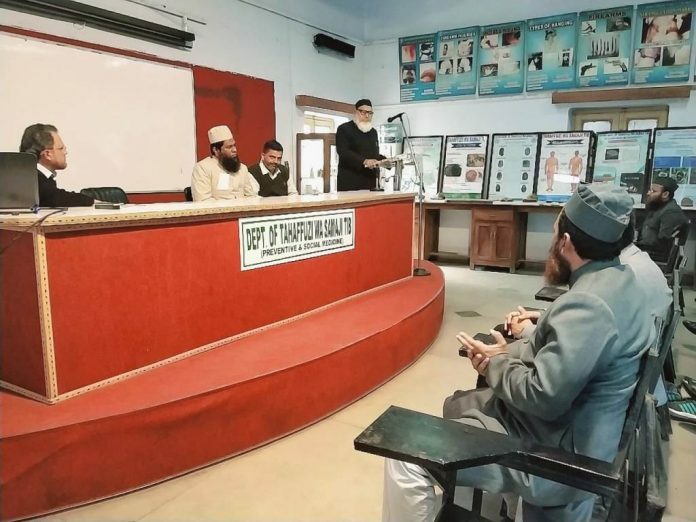 At a symposium held at the Geographical Society of India, Prof Ateeq Ahmad, Chairperson, Department of Geography said that Sir Syed paid special attention to the promotion of mother tongue and established a Scientific Society for translating modern and scientific knowledge into Urdu language. Co-convener, Dr Ahmad Mujtaba Siddiqui urged the students to learn more than one language as it would help them gain better career opportunities. He highlighted the historical significance of Geographical Society, established in 1925, and said it was formed to help students in their literary and cultural development. Dr Firoz Ahmad delineated the origin and development of prominent Indian languages and said the linguistic diversity was the most prominent feature of pluralistic cultural ethos of Indian society. Research scholar Ms Deepika also spoke on the occasion, while Dr Swaleh Zaman, Convener of the programme proposed a vote of thanks. Several students including Mr Shafiq Ahmad, Vice President of the Society presented poems, highlighting the importance of the day. At the Department of Tahaffuzi Wa Samaji Tib, a programme was held to observe the IMLD, in which chief guest, Prof Khan Mohammad Kaiser, Chairman, Department of Tahaffuzi Wa Samaji Tib, Dr M I J Unani Medical College, Maharashtra highlighted the importance of knowing multiple languages and said it would help a doctor communicate with his patients effectively. Prof Khalid Zaman Khan, Dean, Faculty of Unani Medicine said India is a land of linguistic diversity and a perfect physician was one who knew the language of local people. Prof Safdar Ashraf, Chairman of the Department of Tahaffuzi Wa Samaji Tib underlined the significance of mother tongue as the main language of communication. An essay writing competition and an elocution programme was also held on the “Role of Mother Tongue in Health Advocacy” with Dr Ammar Ibne Anwar as a judge of the event. Dr Abdul Aziz conducted the programme while Dr Mohd Usman proposed a vote of thanks. At a similar event held at the Department of Amraz-e-Niswa Wa Atfal, A K Tibbiya College, Ms Aliya, Ms Birjis Fatima and Ms Nazmi Usmani won the first, scond and third prizes, respectively in the essay writing and elocution competition on “Importance of Antenatal Care” and “Myths about Vaccination”. Prof Syeda Aamena Naaz, Chairperson of the department discussed the importance of mother tongue in educating women regarding antenatal and prenatal care.